Hailing from Ipswich, Hodgson came on to the scene in 2009 when he earned an AIS scholarship while also representing the Australian Under-19 Emus at the FIBA World Championships where he helped his country finish fourth. He then moved on to college, playing for Southern Utah as a freshman and was one of two players to start every game during the season. He led the side in blocks and finished fifth in scoring but his role dropped as a sophomore so he transferred to Saint Mary's in 2011. Sitting out for a season, he used the time to compete for Australia at the 2011 Summer Universiade where he averaged 4.7 points and 3.6 rebounds in seven games and on his return to the Gaels, ranked 11th in the West Coast Conference and sat for his team in blocks. 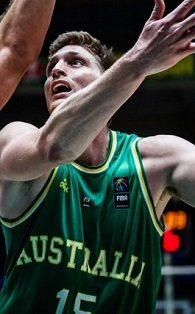 After graduating from Saint Mary's, Hodgson returned to Australia and joined the Frankston Blues for the rest of the SEABL season before signing with the Adelaide 36ers in the NBL in 2015. His 18-point debut was the third most productive in 36ers history while he won Player of the Game honours. In 2016, Hodgson joined the Waverley Falcons and with a double-double average, he subsequently earned Big V All-Star Five honors and was named Co-Defensive Player of the Year. Having re-signed with the 36ers, Hodgson also played an integral role in the Boomers' gold medal performance at the FIBA Asia Cup in 2017 as he provided a big presence at both ends of the floor to help them advance through the tournament undefeated. After three years with the 36ers, Hodgson signed a one-year deal with the Brisbane Bullets for the 2018/19 NBL season. Meanwhile, throughout the World Cup Qualifiers Hodgson established himself as a regular member of Andrej Lemanis' Boomers squad.